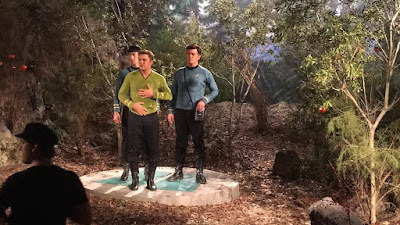 As episode directors Vic Mignogna and James Kerwin surveyed the remaining stories that would round out the STAR TREK CONTINUES tale, they identified two opportunities to take advantage of a Planet Set envisioned for the southern Georgia warehouse that is home to the sets of the series. “Our fans provided the resources to build a Planet Set, and once again we are following through with our promise – to deliver a spectacular set that will look and feel just like those great worlds they had on Stage 10 — at Paramount, fake rocks and all. And I’m pleased to say that you’ll see this same, new set dressed completely differently in our remaining episodes,” Mignogna said. “After we agreed on a story for Episode Nine, I decided to add a scene at the beginning that takes place on our new set. But it would be a much different world than the one already planned for our last two episodes. I don’t think it’s a big spoiler to mention that our two-parter will include a barren, rocky planet. But first, Episode Nine takes place, in part, on a lush and heavily forested site,” said Mignogna. But the warehouse housing the STAR TREK CONTINUES production only had a limited amount of space not already dedicated to standing sets of the Enterprise. Makeup, Wardrobe, Prop, and Construction spaces were already committed, and so attention turned to a large room formerly used as a weekly gathering space and vacated by a local church. “Our answer to the small size of the space was to build two permanent, strategically-placed rocky ridges out of styrene foam, up to 12 feet high, and combine that with a ground plane that sloped up as it neared the green screen back wall. The ground surface was coated with something I formulated to give it a natural rocky desert look without us having to haul in dozens of tons of shifting, dust-cloud prone dirt. Also, the coating contained plasticizers to make it less painful when our actors had to do stunts on it. There were also more exotic materials we had to order from far away, such as high-volume polyurethane insulation foam sprayers and large quantities of liquid latex,” said Greg Dykstra, who served as Art Director for Episode Nine of the series. “Volunteer Scott Grainger and I largely worked out the plans and execution. The planet set crew consisted of over a dozen people (not all working together at the same time) that also included Brandon Sharpe, Joseph John Roberts, Royal Weaver, Sam Rooks, Jay Pennington, Adam Dykstra, Molly Dykstra, Natalie George, Heather Grace Young, myself, and of course Vic, who had a vision about how we could make the Planet Set work in our available space,” Greg said. “It was completely different from any other set we had built for STAR TREK CONTINUES. All the sets for the Enterprise are based on the original. There are photos to compare to, detailed measurements, exact colors that need to be in the final sets. With the Planet Set, we had a blank canvas, so to speak. 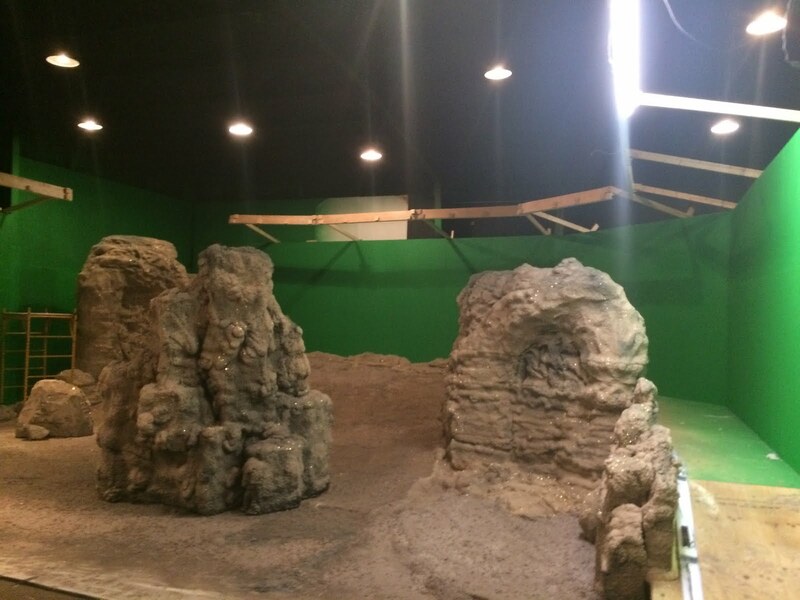 We knew it would need a massive green screen to add the depth we would need for the shots,” explained John Roberts, who put his construction skills to work on the Planet Set project, plus served as Art Director on the final two episodes of the series. “About 90% of our sets came from Lowe’s Hardware! Who knew you could build homes and space ships and planets from a hardware store? The big foam pieces came from a shop in Jacksonville, Florida, and that was the same place that did the foam work for the warp core and ceiling of Scotty’s Engineering Room,” Roberts said. “The rocks for the planet are interesting. Most were sprayed with an expanding foam. Foam isn’t cheap and we used a ton of it! But, we knew we needed another big, movable rock and used up any spare foam and boxes. Once those items were taped together, they were sprayed with the expanding foam. It took a couple of layers before the lines of the boxes disappeared, but it worked perfectly. The rock was probably 10 feet tall with an eight foot wide base. Since it was mostly hollow, three people could move it for different shots and camera angles,” Roberts explains. “It was hard, messy physical labor” to create the Planet Set, which also had to be designed to be removable after production ended. For Episode Nine, the barren planet had to look like a national park, with stately trees and a rolling landscape. “A couple of our volunteers went to Wal-Mart and found a bed sheet set that had a print of fall leaves and twigs. So we emptied that store of their camouflage sheets and stapled those sheets to our latex, dirt ground. Then, our team filled many trash bags full of dead leaves and twigs and we covered that set with actual foliage. Thankfully, wintertime in southern Georgia produces lots of dead leaves. We used the leaves to break up the pattern of the bedsheets. And it works like magic. It looks so real, and so good onscreen. 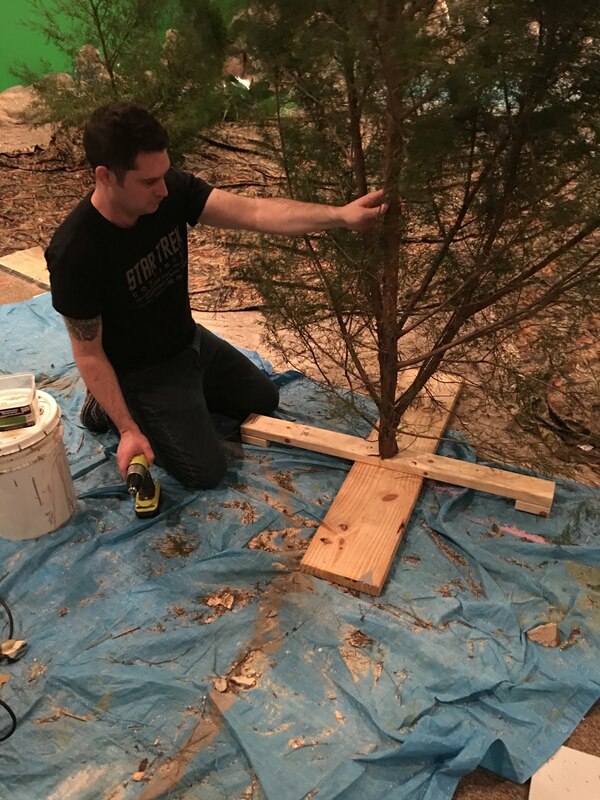 And then we dug up or cut down small trees near the studio and made criss-cross wooden bases so that we could strategically place the trees wherever they were needed,” Mignogna said. The crowning touch was an old theatrical trick that worked wonders.